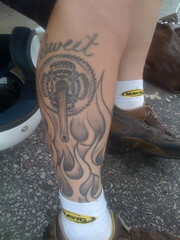 Now that’s bike culture … tattooing a crank arm on your leg. Sweet Rob also made sure we got into the Mavic cars for live blogging during the USPro Race. Greenville has a burgeoning bike culture — while we didn’t see any commuters, we did meet urban cyclists, one Critical Mass rider, and spotted a Nishiki with Godspeed Tensioner in the crowd. During the Style in Motion Weekend, I talked with George Hincapie and other Greenville business about their enthusiam for the sport and recreational cycling. In downtown Greenville, Postcards from Paris sells European interiors alongside high-end bikes and Hincapie Sporstwear’s 09 line features Apres-ride clothes for bike shops to sell. We also talked about how their town has one, block-long bike lane. 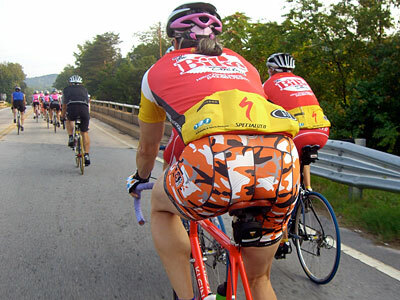 Not big enough for messengers, without a college, and snake-house-humid heat, Greenville just doesn’t have that many cyclists riding around town, but they’ve certainly got them riding in the country, racing, and on charity rides. Continuing the bike-culture topic with Steve Johnson, CEO of USA Cycling, I suggested they work on including more lifestyle events during the big races. The cycling lifestyle doesn’t delineate bike culture and neither should they. In other words, a race like USPro could encourage alt-transport, local racing, even alley cat racing when it comes to town. I’m sure we’ll talk about that more at future events in 09. And readers we’ve got more bike culture coming this Fall from Vegas, Amsterdam, Rome, Taipei, and Boston.